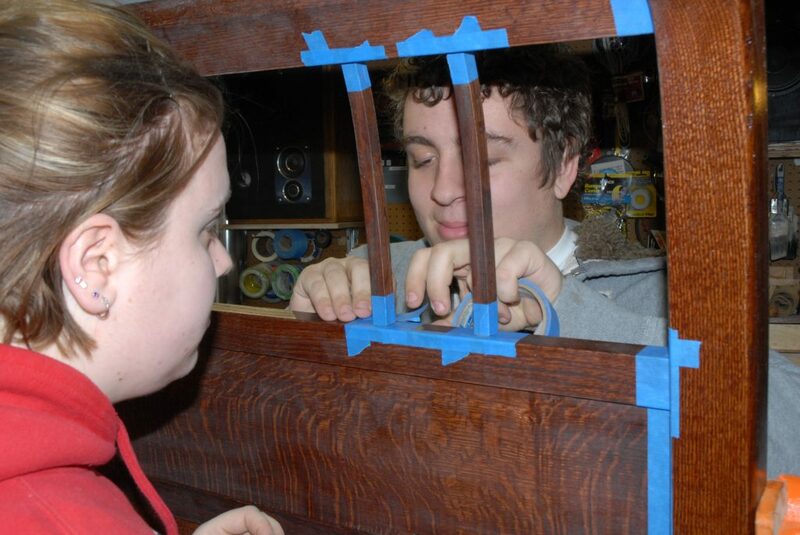 Today we were mortising the crib side rails and slats. 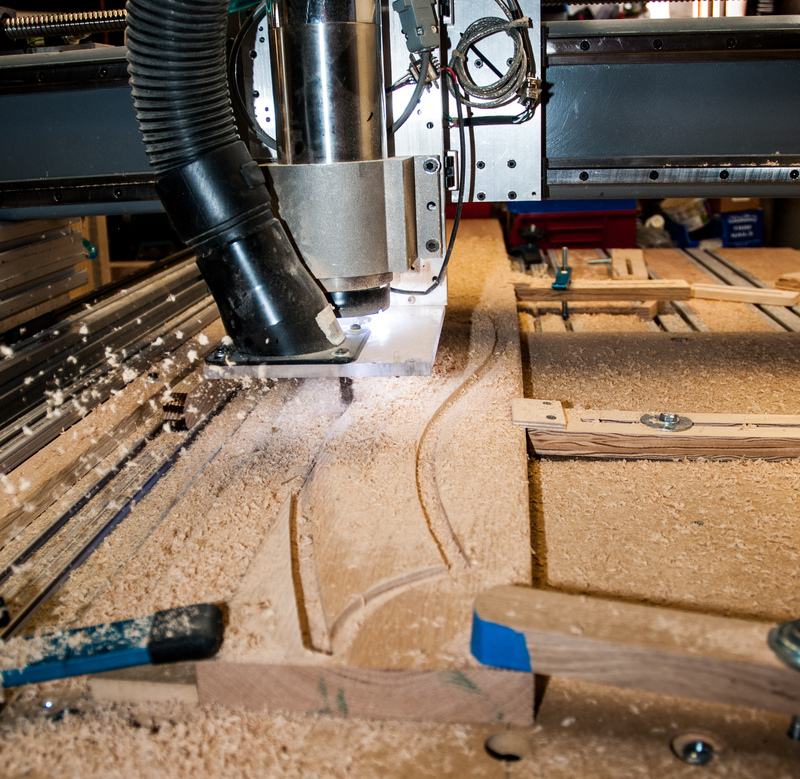 The lower rail mortises were done on the CNC router. 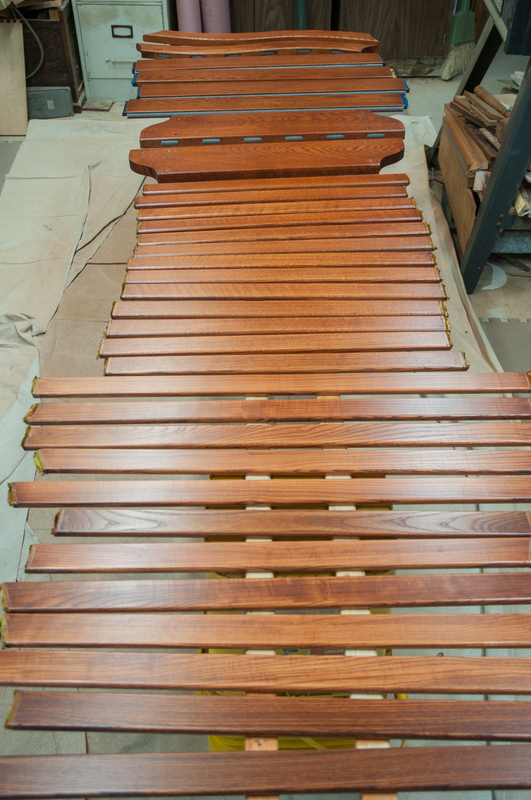 Overall, there are 50 mortises to cut for the slats. 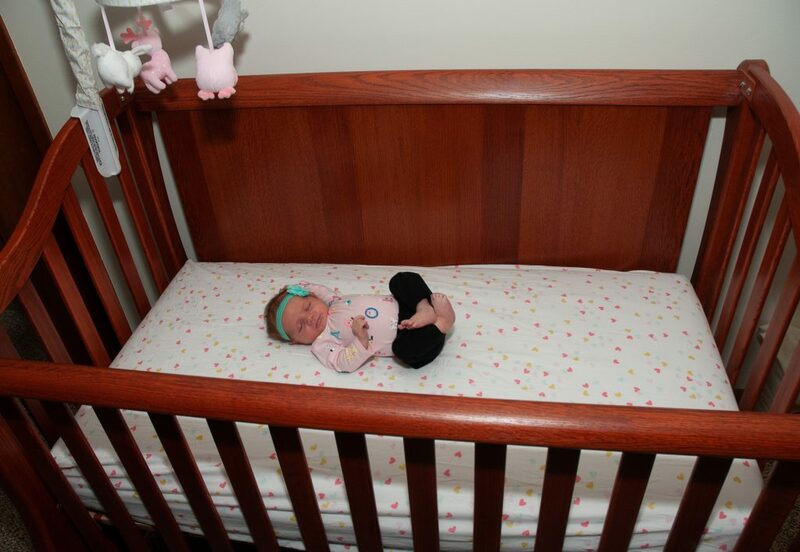 The front rails are 5″ tall and the end rails are and 6″ tall. So these had to be clamped upright to the left pf the main work area on the router top. A new fence was made on the left edge of the work area to support the rails in the vertical position. The fence was made from some 2×2 scrap stock. 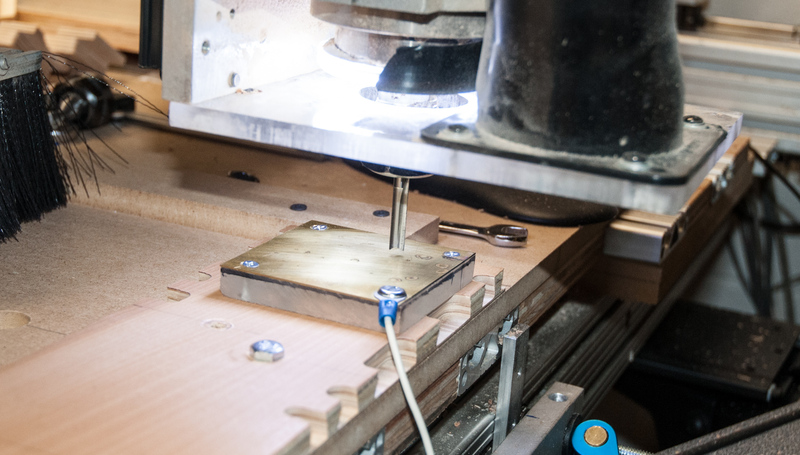 Once drilled and bolted in place, the router was used to cut the left face so that it was perfectly aligned with the router Y axis and exactly plumb. As you can see clamping the ends is quite easy. 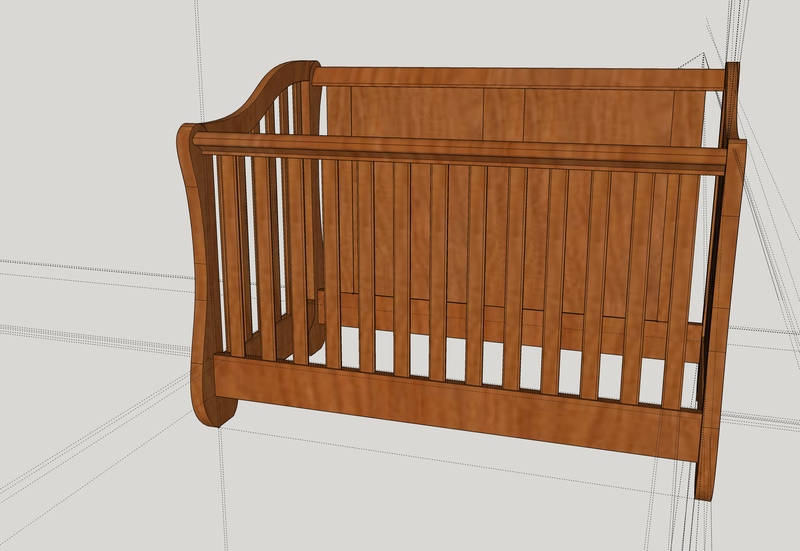 This is adequate for the crib end rails but not enough for the long front rail. 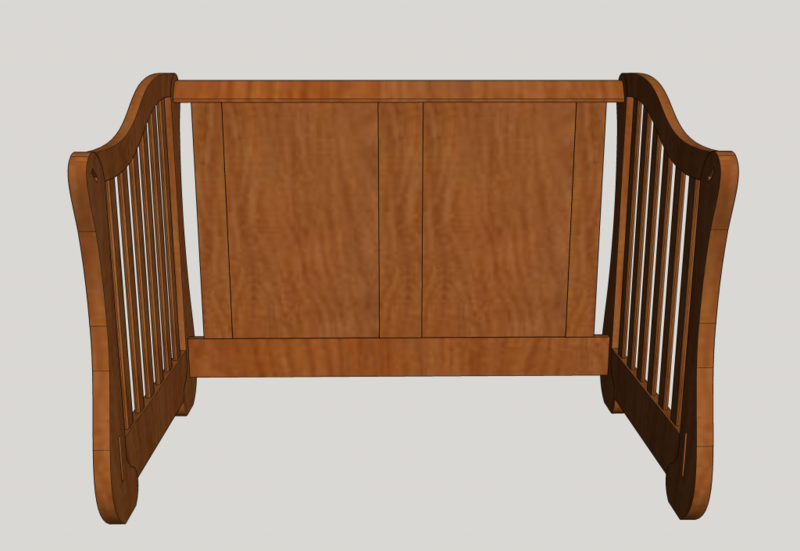 The front rail is about 53″ long and needs some support in the middle. 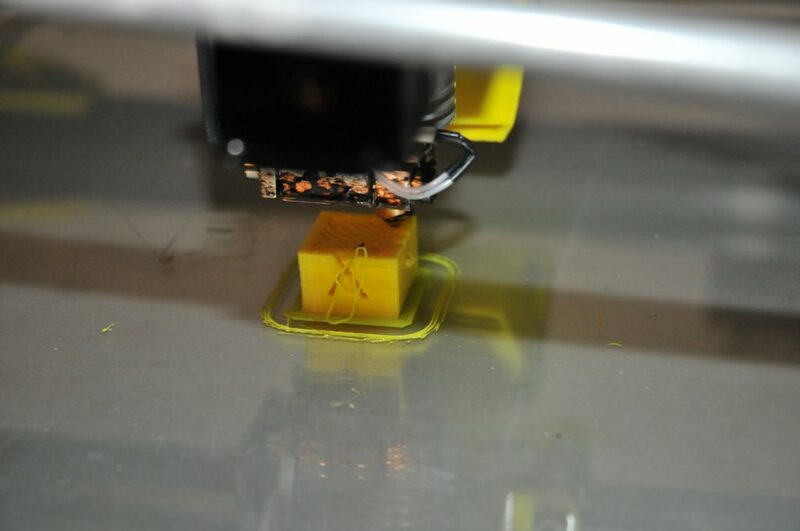 There is no good way to add a conventional clamp as are used on the ends. 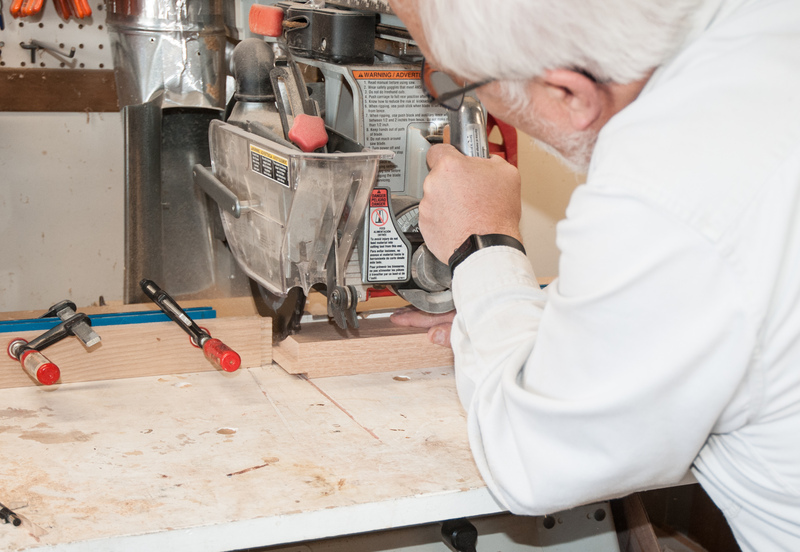 At this time, the router does not have enough vertical travel to clear clamps placed over the top of the boards and there is always the fear of a crash with a misplaced clamp. So this was solved by taking a scrap of 3/4″ plywood and sawing it into a pair of wedges. These are placed between the stock and the side rail. 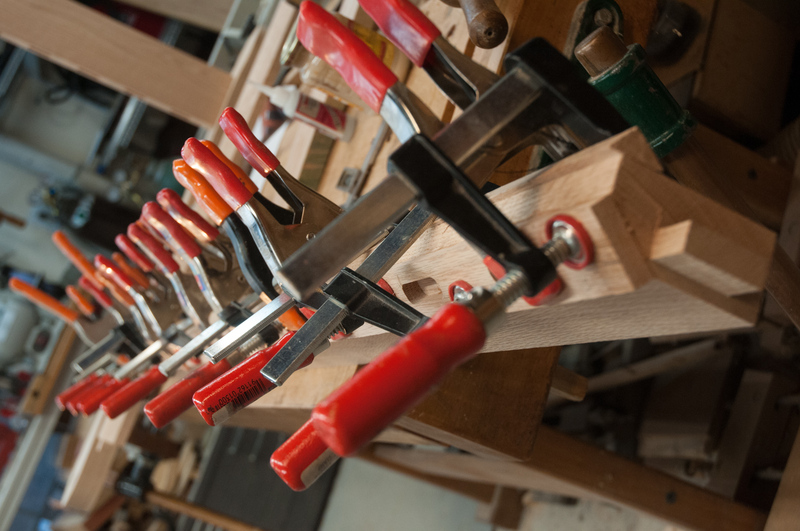 A few taps with a hammer, and the wood is secured. 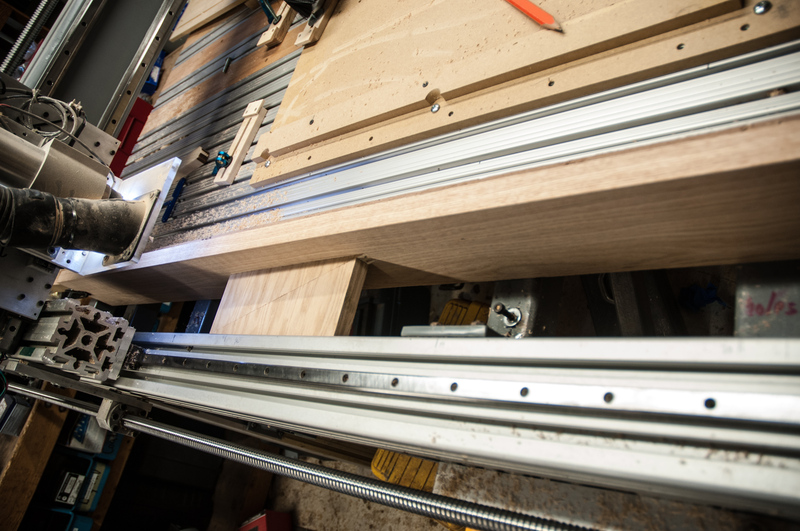 Here you can see the front rail clamped in place ready for the cuts. 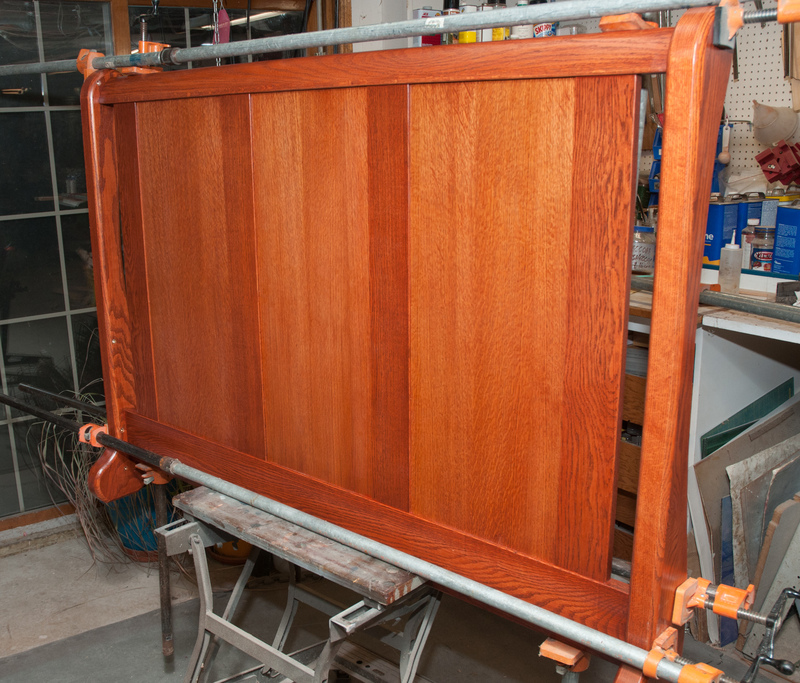 The top end rails need to be done conventionally with a plunge router and fence. 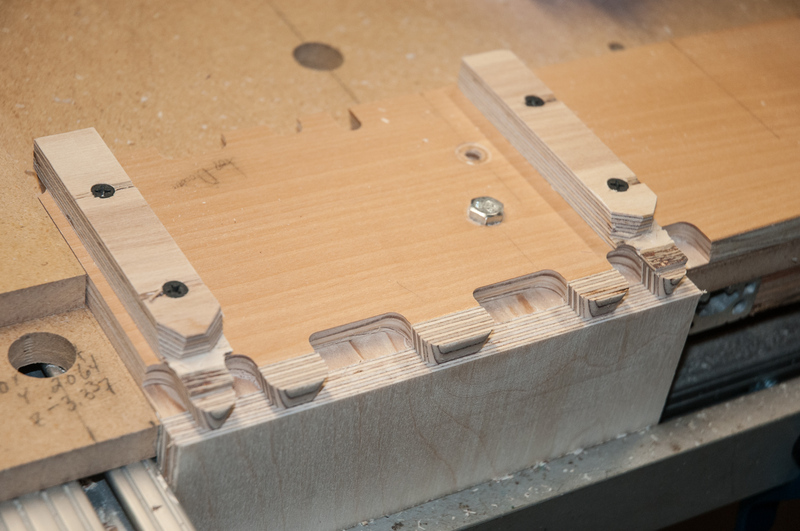 However the start and stop points for each mortise need to be transferred to the parts. However they are curved and there is a 6.5″ rise from the front edge to the back. 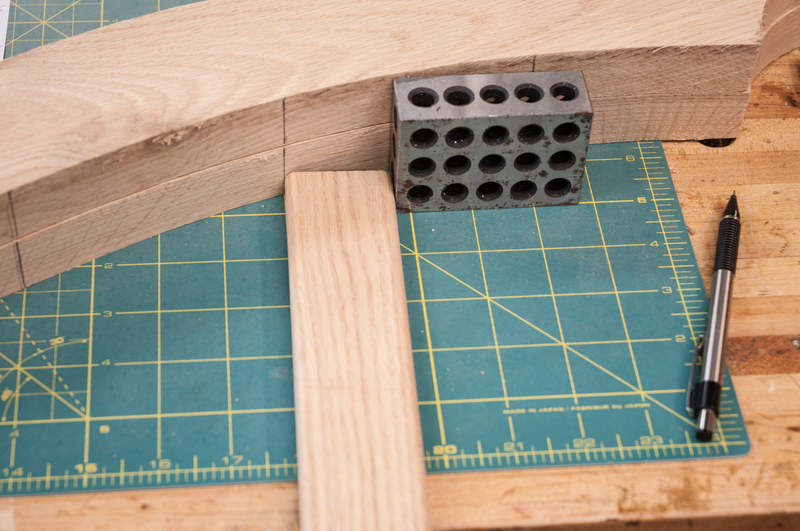 Armed with a dimensioned drawing and a cutting mat, the parts were aligned to the grid of the cutting mat and a 1-2-3 block was then used as the vertical guide. 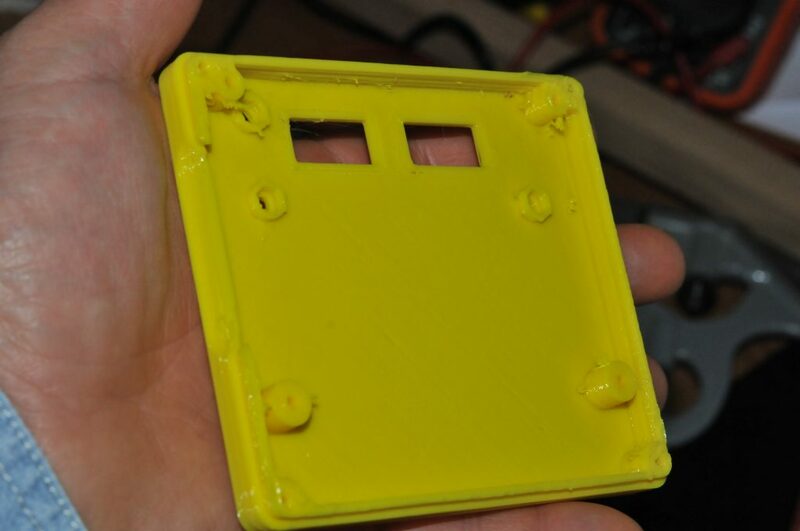 A block of wood would work as well, but the mass of the metal block made things easier. 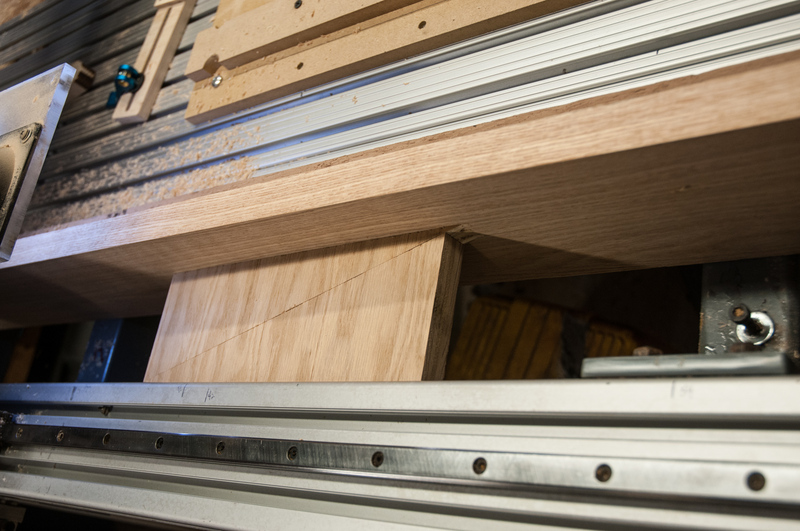 Here the leading edges of each mortise are being transferred. The mortises now need the trailing edge marked. This is easily done by aligning one of the slats with the leading edge mark and then bringing the 1-2-3 block up to it and then making the mark. 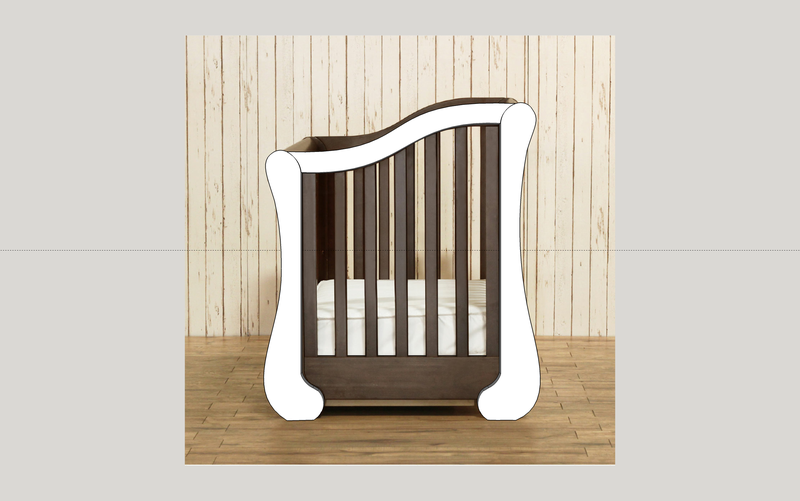 The slats are 0.5×1.75″ and the corners are rounded over with a 3/16″ radius. 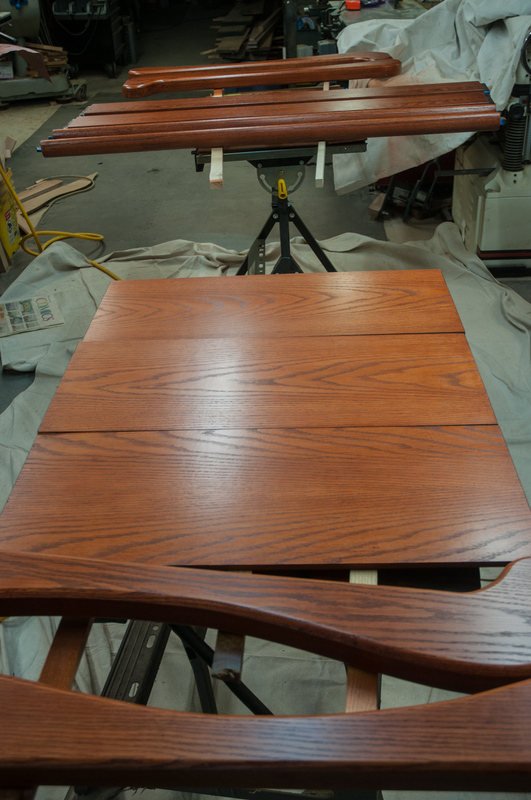 This is done at the router table, which is an extension of my table saw. Feather boards are placed to guide the cut (fewer ripples) and protect Teal’s fingers. After the photo Teal tucked the ties of her sweatshirt in. 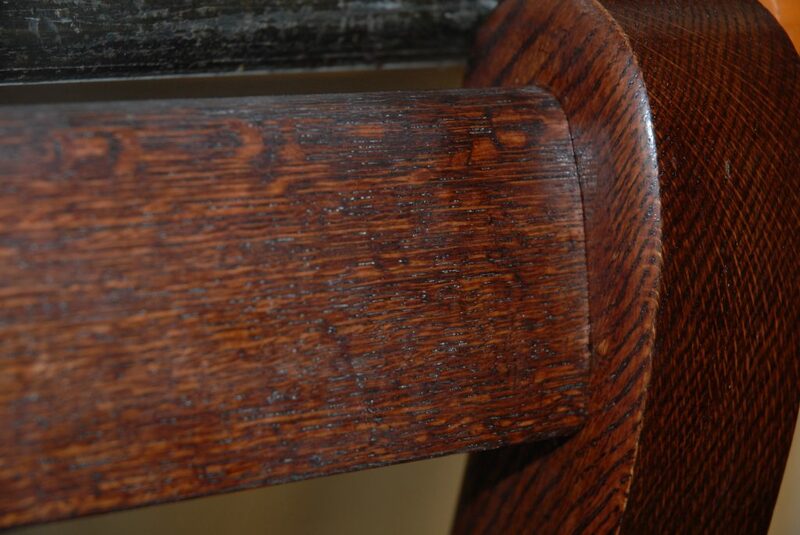 The front and back top rails are curved as can be seen in the end view below. The rails start as a rectangular piece of stock 1.5×3″. 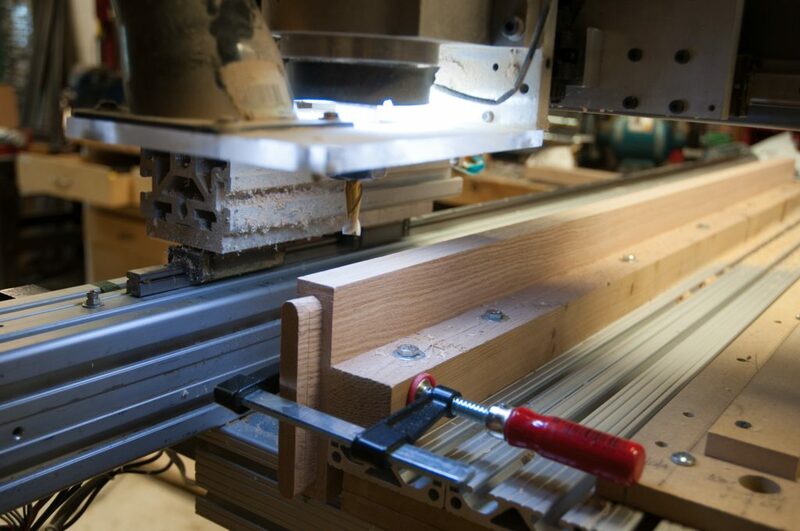 The first task is to cut the tenons on each end. 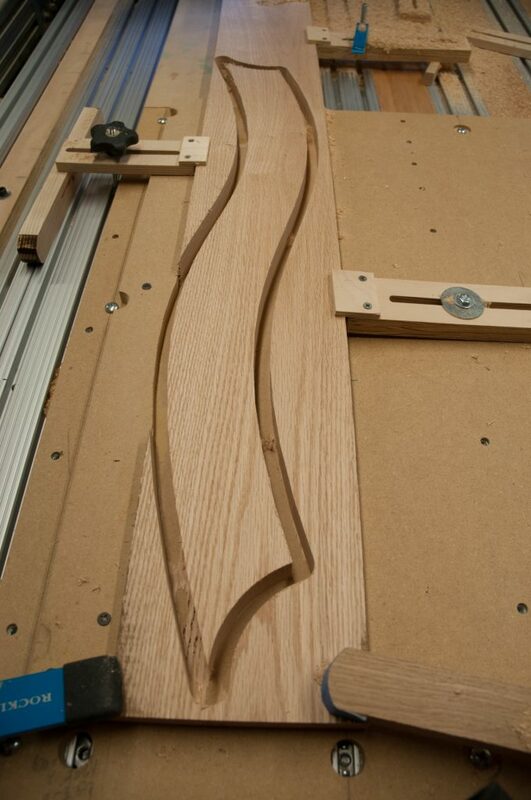 This is done at the radial arm saw with a dado blade. An end stop is set for the length of the tenon and they are cut in 2 passes as you can see below where I am cutting the second pass. 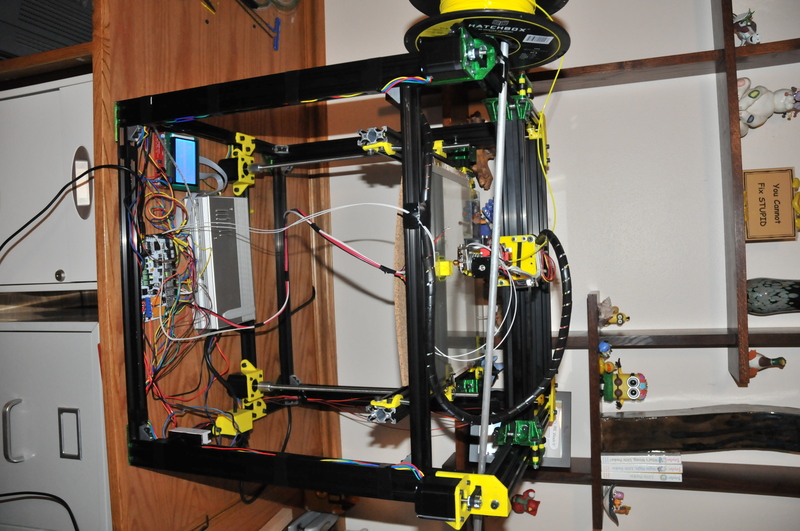 Having the digital readout on the height adjustment greatly speeds up the setup. The next step is cutting the bottom bevel which is at 38.5 degrees. 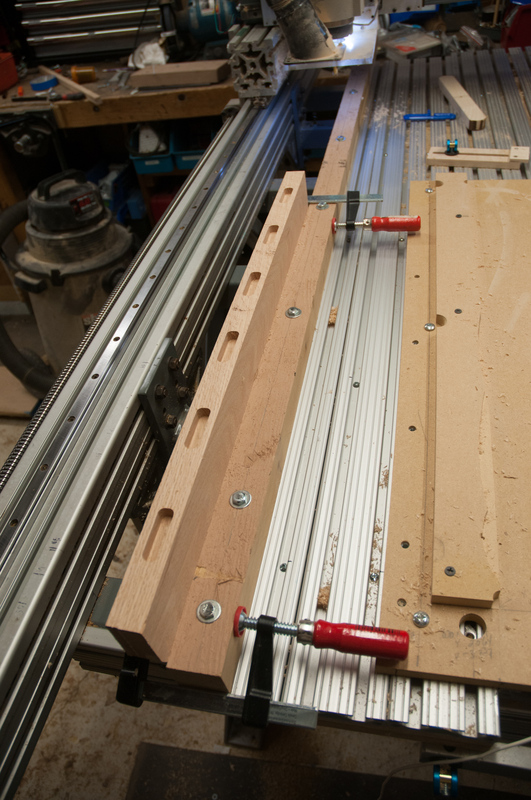 The bottom piece of the rail is 3/8 x 1 1/4″ and the mortises are again cut on the CNC router. 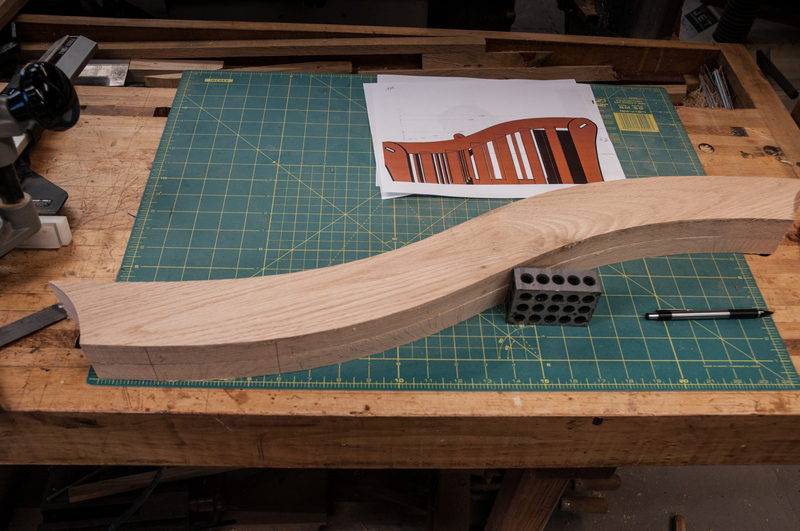 However at that point the stock was left thick for added stability and rigidity and then after they were cut the stock was ripped to the 3/8″ final thickness. 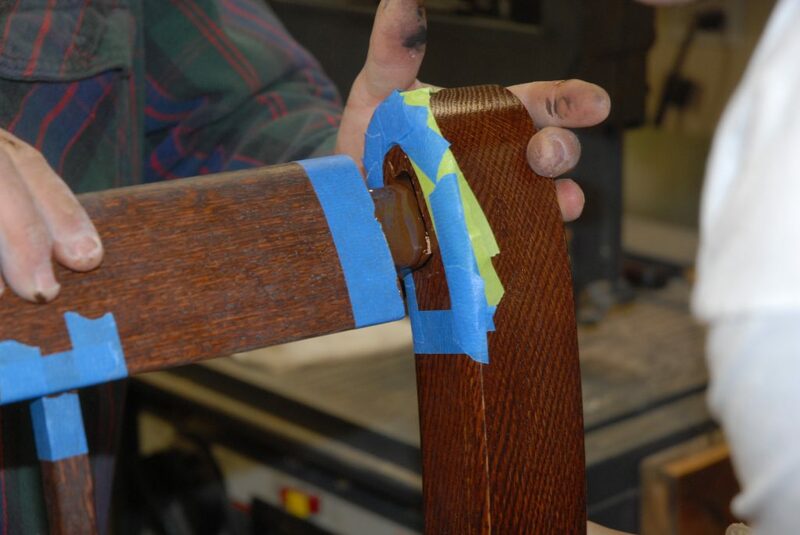 Here the bottom piece is being glued to the rail. 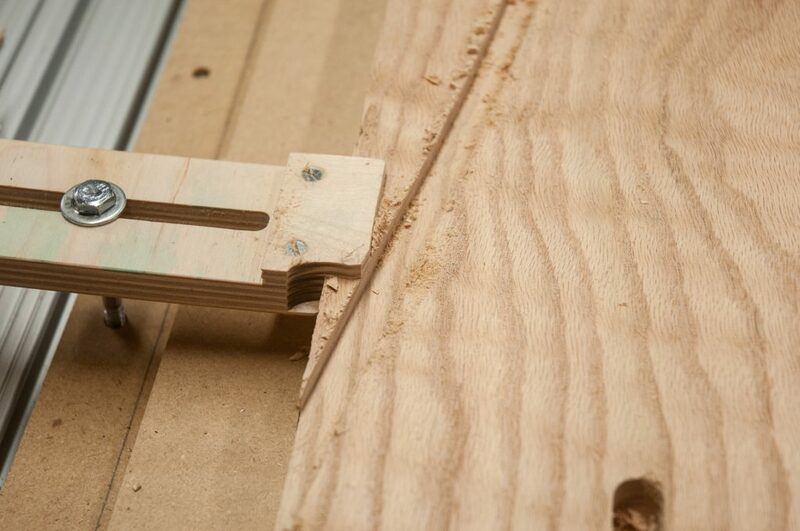 Note the off cut form the angle is being used to provide a grip for the clamps. It is lightly tacked in place with super glue (and some slipped). This is another case where using many clamps with light to medium pressure works better than a few clamps with high pressure. The last few weeks were taken up with vacation and conferences. 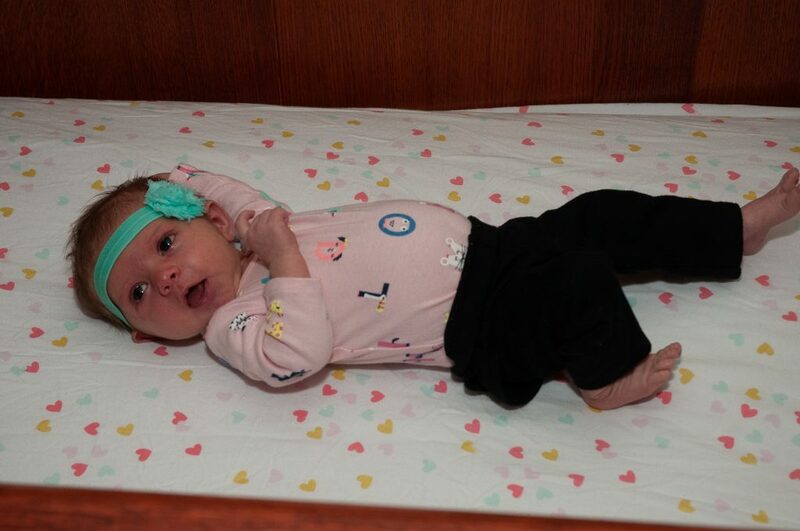 So there has been no progress on the crib. Teal and I had brought in the last of the wood from the shed, but it was not thick enough for this project and has to wait for another project. 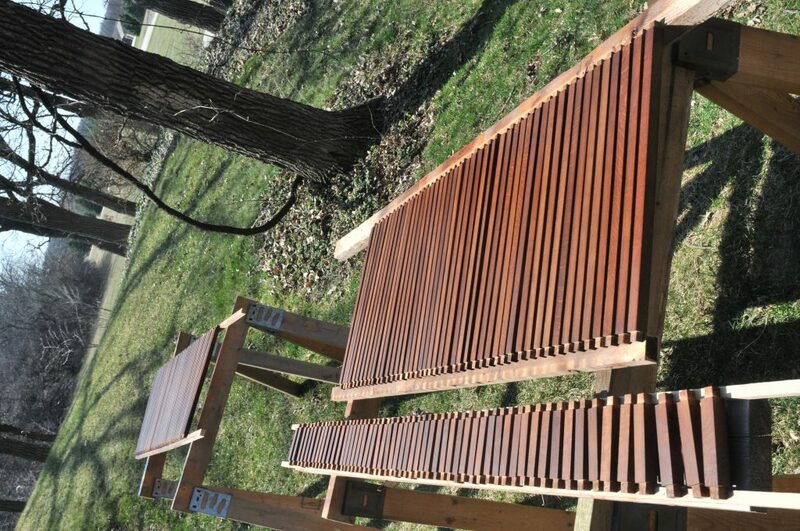 This was the last of the Wisconsin Woodworker’s Guild Logfest hauls that I had set up to air dry. 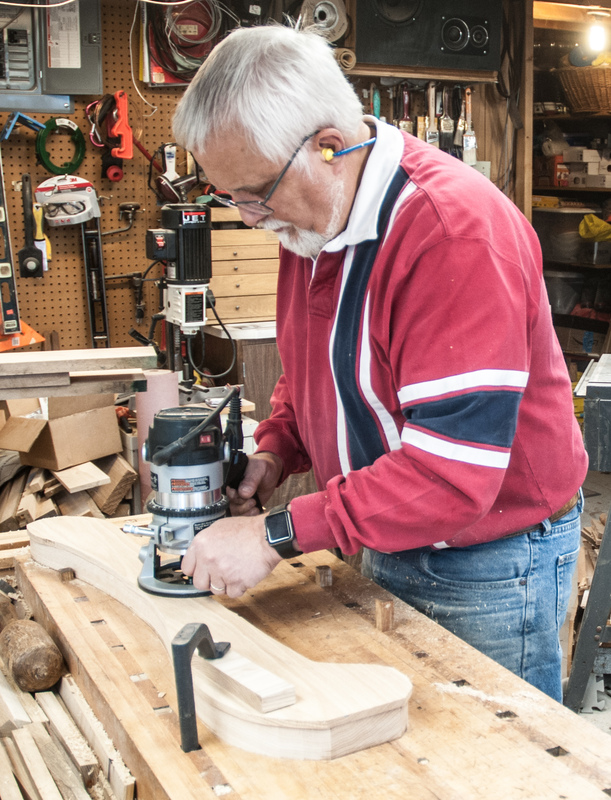 At its peak, it was over 1300 board foot of lumber, which has now been reconstituted into many pieces of furniture for the family and friends. So yesterday we set off for Kettle Moraine Hardwoods which is our local lumber mill. 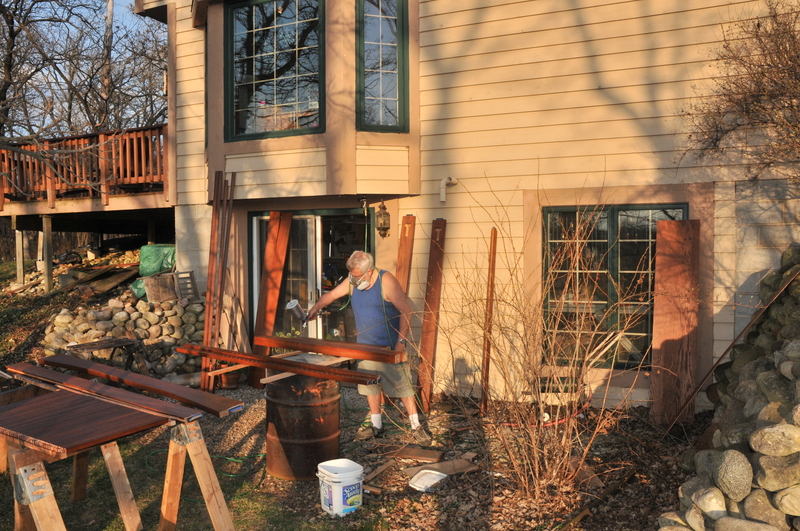 They had a nice selection of thick Red Oak (5/4 and 8/4 – 1.25-2″ thick) and we picked up some Hard Maple and an Elm slab for future projects, as well. 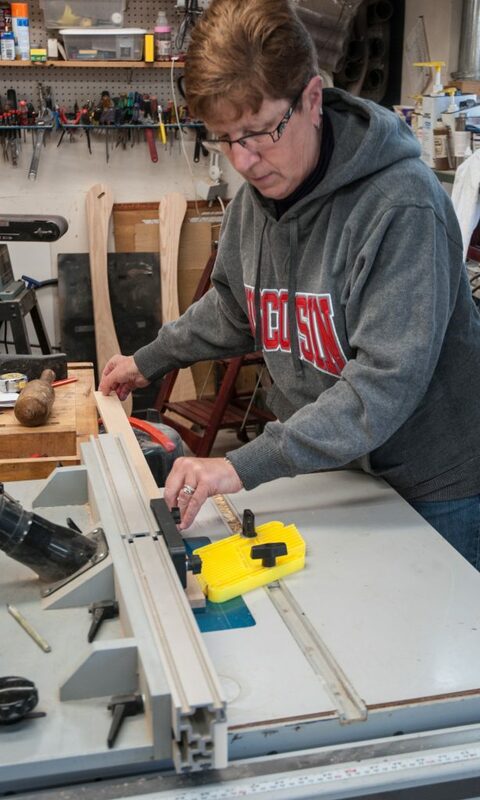 Once home, it was time to surface the boards on the jointer and planer and then cut them to rough length in preparation for sending them to the CNC router. 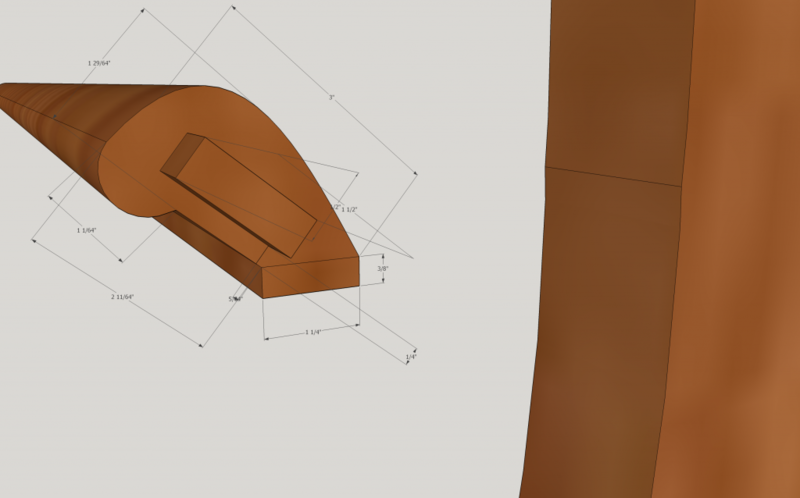 At this point, there was a minor design change as the thick stock for the legs was completely cleaned up at 1.86″ vs the 1.5″ I had in the design. 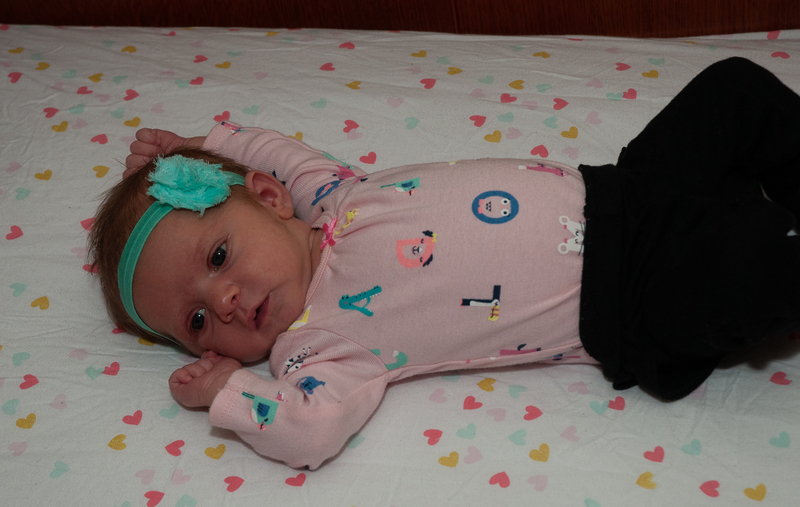 So we decided to go with thicker legs. 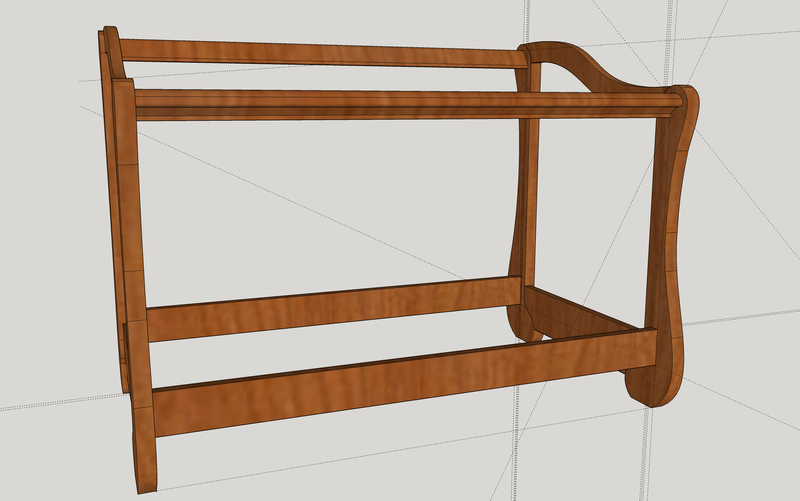 However, this leads to more work as I did not have a router bit that would cut deep enough, which will be detailed later below. I fired up the computer for the CNC router and some problems arose. I had not used it for ~2 months and only had the windows 10 logo showing for 45 min. At this point, I rebooted again and it came up in a few minutes. However, Mach 4 which is the CNC controller software for the router had a whole series of errors when starting, and was unusable. Most of the plugins would not work. So I restored it from the backup copy, restarted the PC again and it started to work. 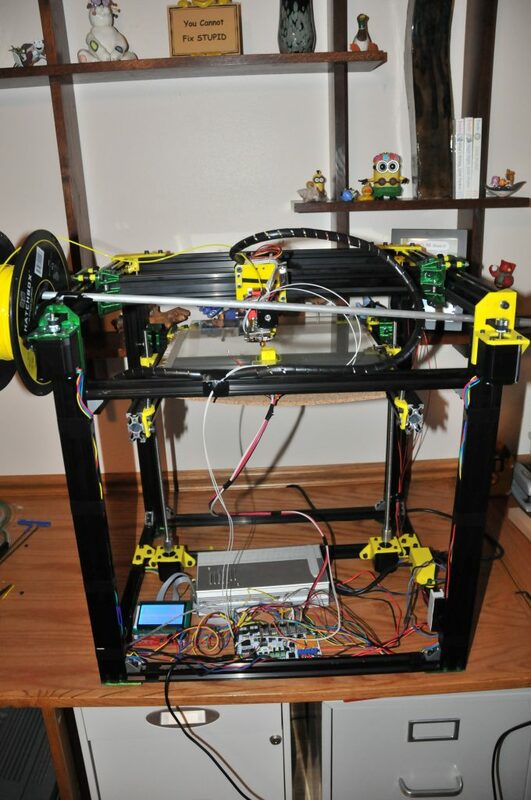 However, in testing, many of the configuration parameters were missing including “little things” like the home switches and control for the spindle. Digging through my notes for the configuration values, I got it running again. Now, thoroughly annoyed, it was time for a reward of our home brew Imperial Stout which is now ready for consumption. 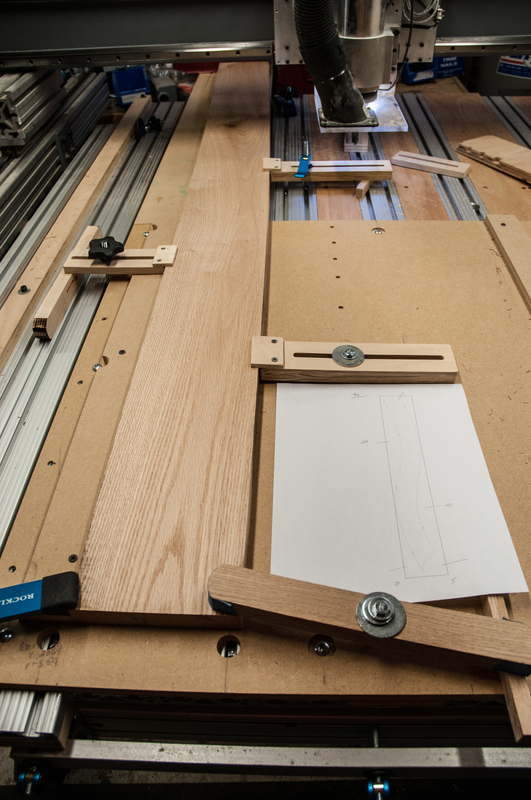 After re-zeroing the CNC router it was time to set up the first part and make a test run. 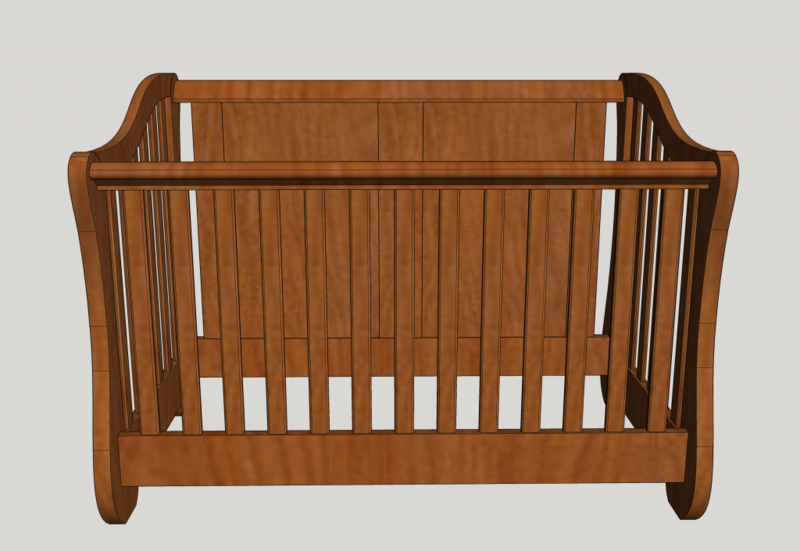 The crib end top rails were chosen as they are the smallest parts and least costly in case of problems. The 8/4 stock for the leg pieces was over $150. Making wach leg approximately $35-50, so I was not going to try those first. So the stock is clamped on the CNC router and you can see my “cheat sheet” where I have printed out the outline and marked the distances from the near end for the various clamps. Next you can see the cut under way. At this point I have left off the dust shoe, so there are chips EVERYWHERE. Now the top rail is completed and vacuumed off. Another shot in progress, looking down with the dust shoe in place. 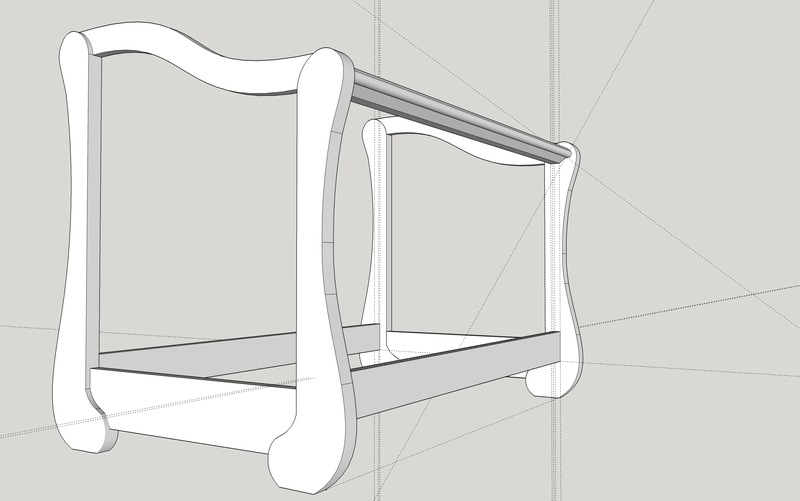 With the top rails successfully completed, now I move on to making the legs. One of the front legs being cut. In order to prevent the part moving I used not only the 5 clamps shown but also some small strips of double stick tape which help reduce the part sliding under load immensely. 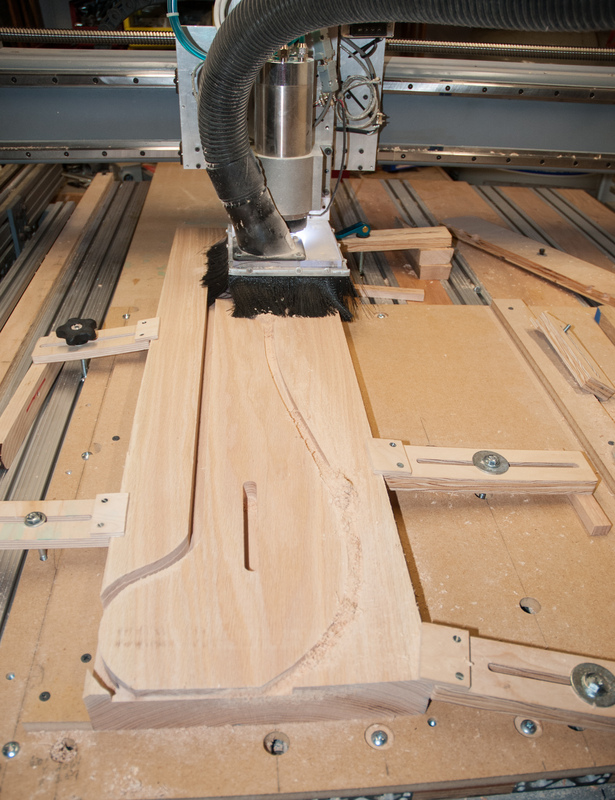 With this CNC router, the limitation on cutting speed is not the machine, but the ability to clamp the work and avoid it slipping under the cutting forces. 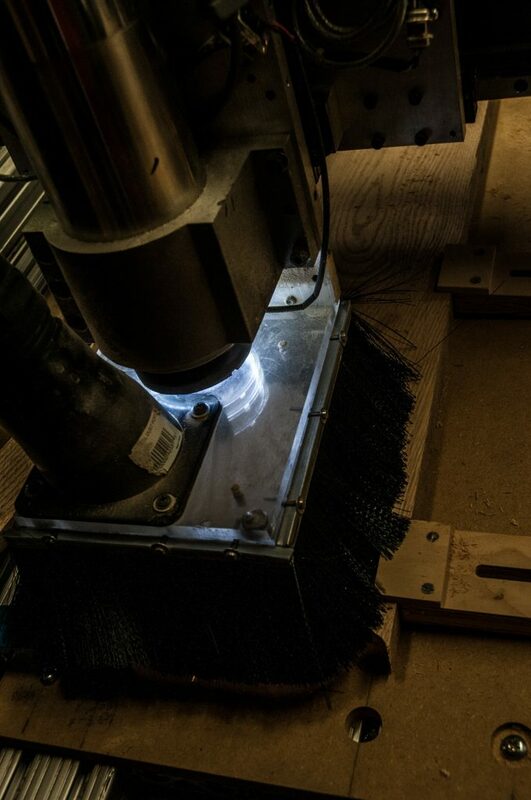 Cutting speed was 100 inches per minute, 18,000 RPM at 1/4″ depth of cut with a 1/2″ 2 flute carbide end mill. Set up for one of the rear legs – 43″, 110 cm long. 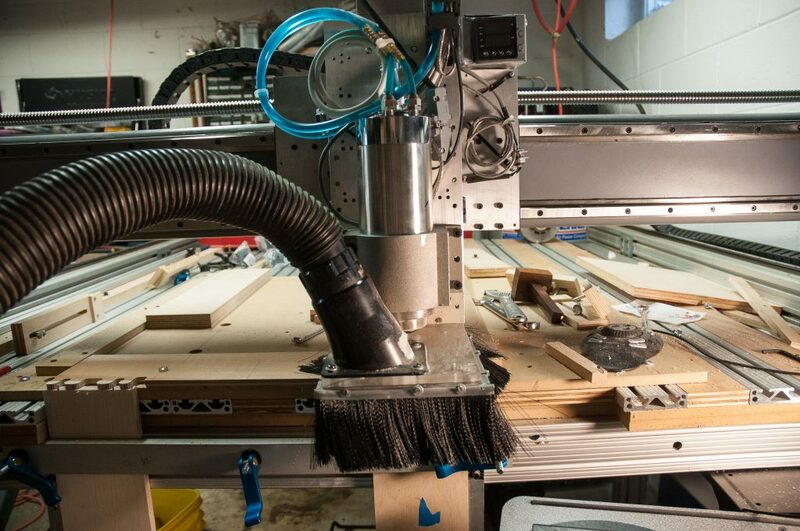 Not your ordinary tabletop CNC router. . Note the beautiful curl figure in the stock. 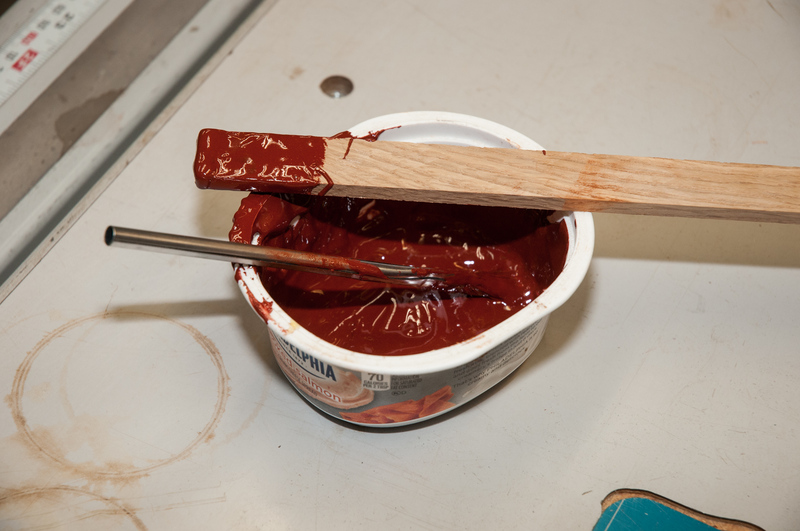 Later, you will see how I make this “pop” when finishing. This is why I use wooden clamps. Just a minor nick this time. 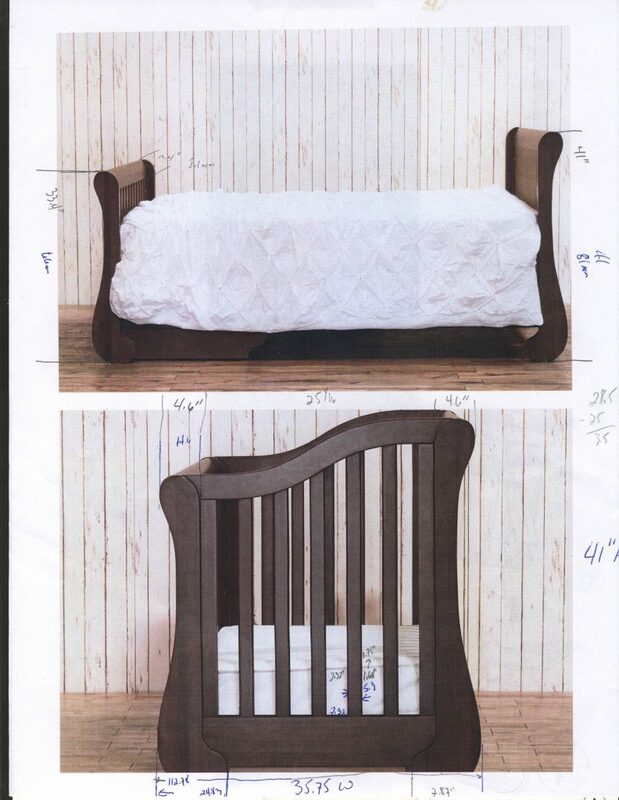 These are shop made on the CNC router. Another look at the scale of these cuts and the finish off the CNC router. 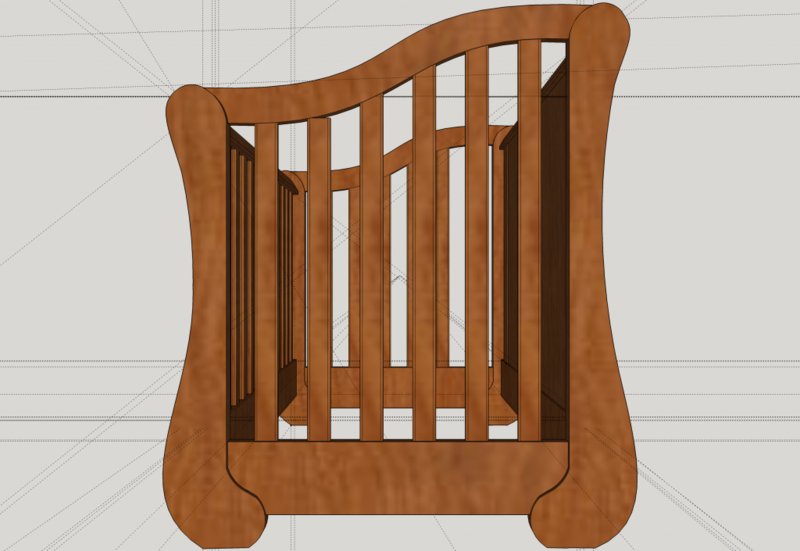 This was without a reverse last pass as I don’t (yet) have a router bit long enough to do so and that would look even better. 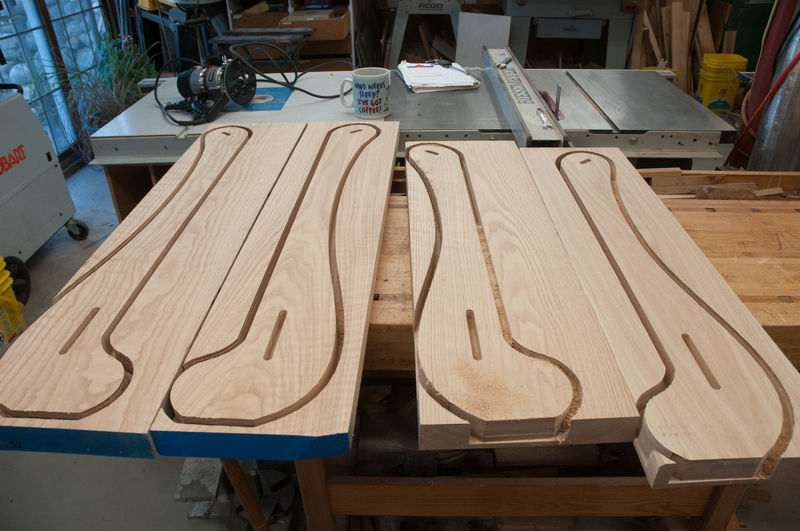 Here are the legs off the CNC router. As you can see I was not able to cut all of the way through. 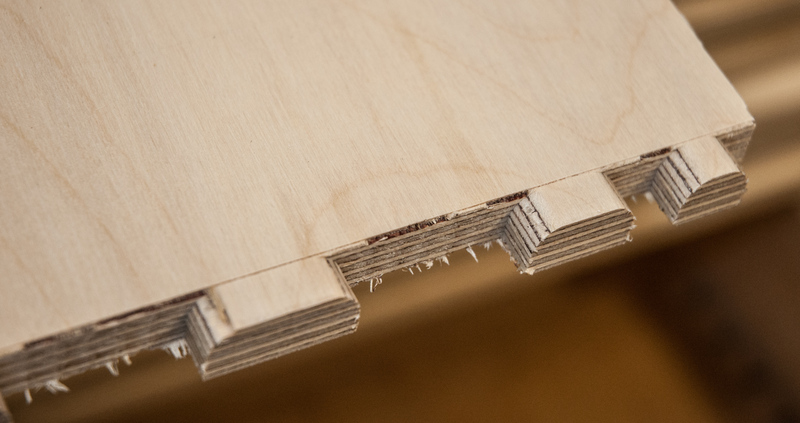 The depth of cut was limited to 1.5″ based on my largest end mill / router bit. So now they need to be run through the band saws and then flush trim routed. 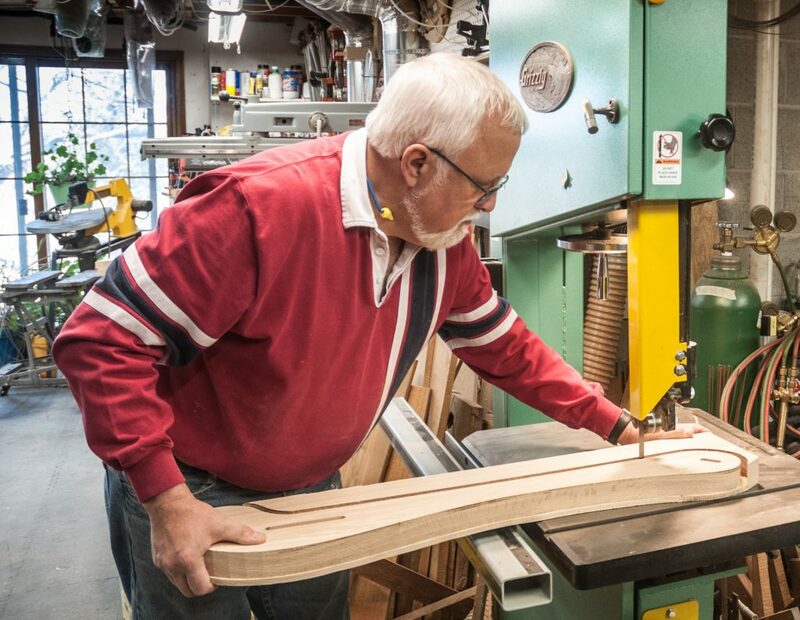 The end curves are too tight for my big band saw (24″ with 1/2″ resaw blade ) and need to be run through my small one (12″ with 1/4″ skip tooth blade). 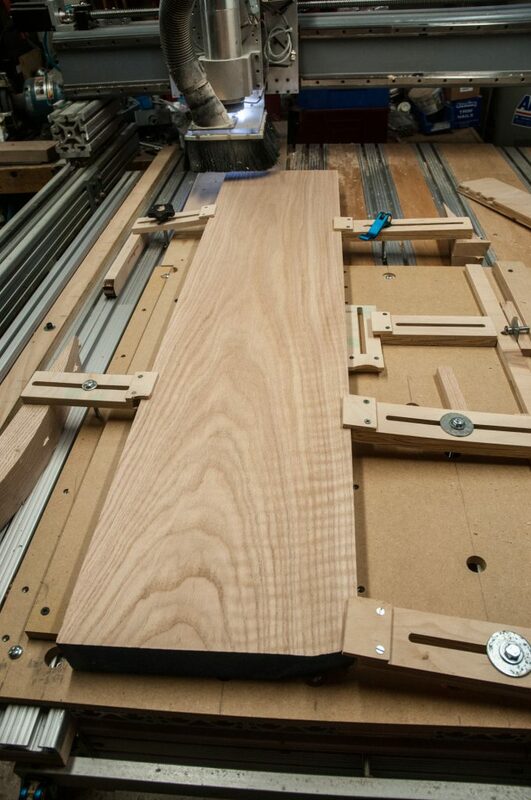 Bandsawing the excess off the legs on the 24″ band saw. Flush trimming off the excess. The holdfast works great to clamp irregular stock like this. Teal also assisted in taming the work. The Oak is a bit unruly. I often had to reverse directions to minimize tear out. This means taking climb cuts which try to throw the work and router around. First dry fit test. Not bad. 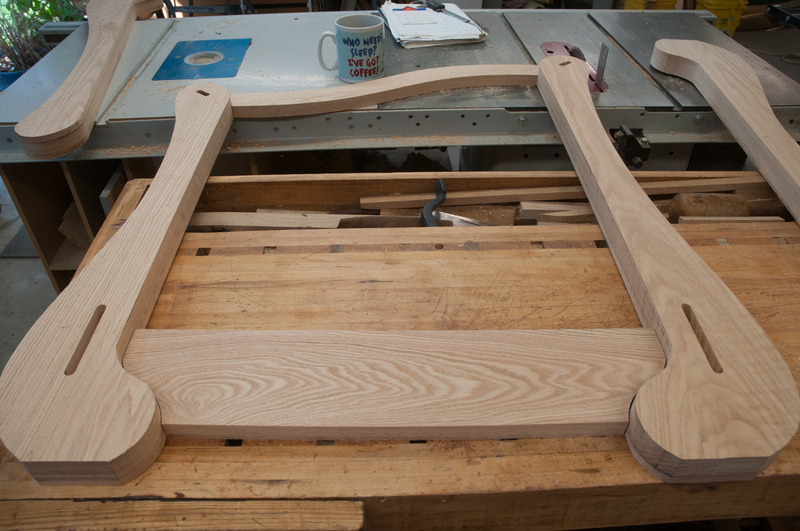 The cross pieces will be flush with the upper / inside edges of the legs in the final assembly. 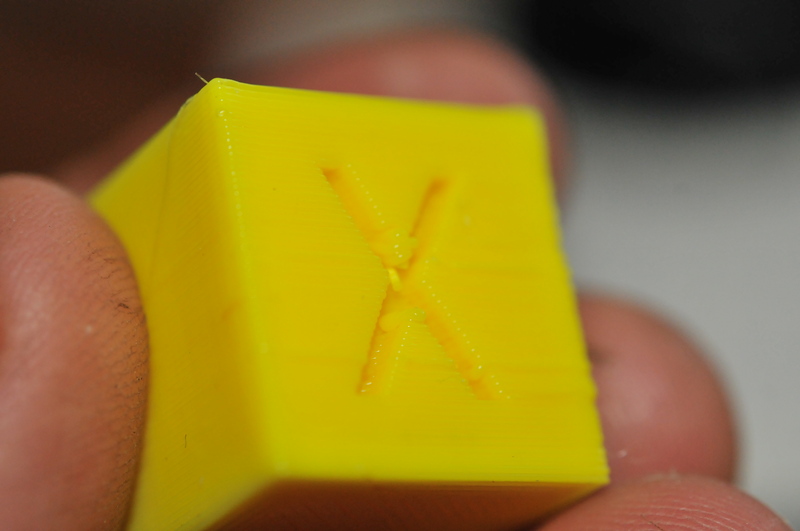 The CNC router made this work feasible in a few hours. 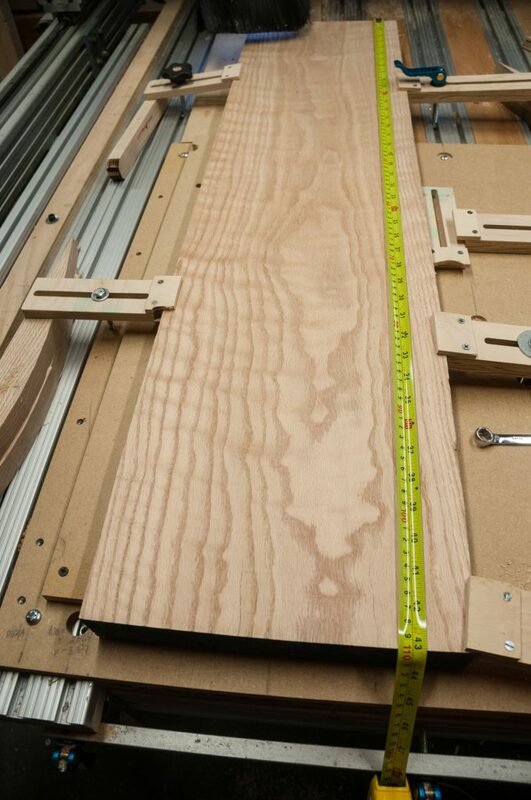 Otherwise I would have had to make templates, band saw to size and flush trim through several steps. 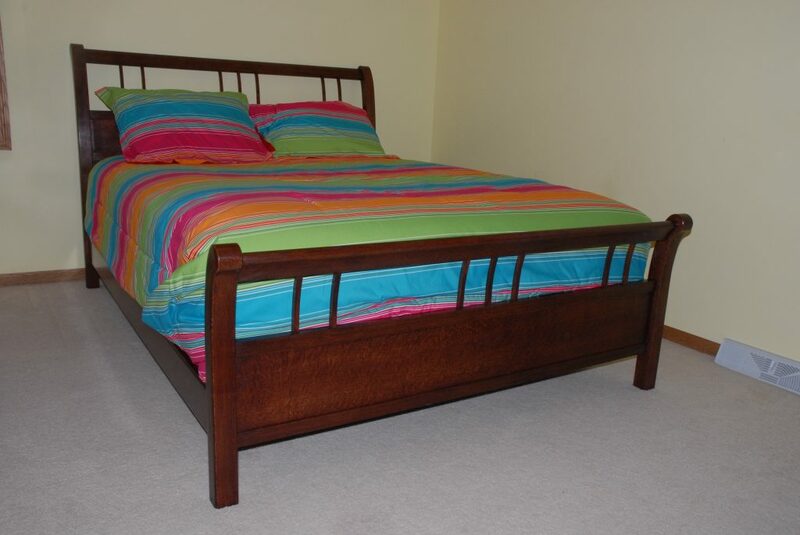 I had done a similar project with curved legs – Elyse’s Sleigh Bed. This is MUCH easier and with less chip out to fix. The first part is without the dust shoe (chips Everywhere) and the second part is with the dust shoe in place (much neater) . Consistency and repeatability are paramount. This lead to fixture board end stop additions and minor redesign to remove most human error. 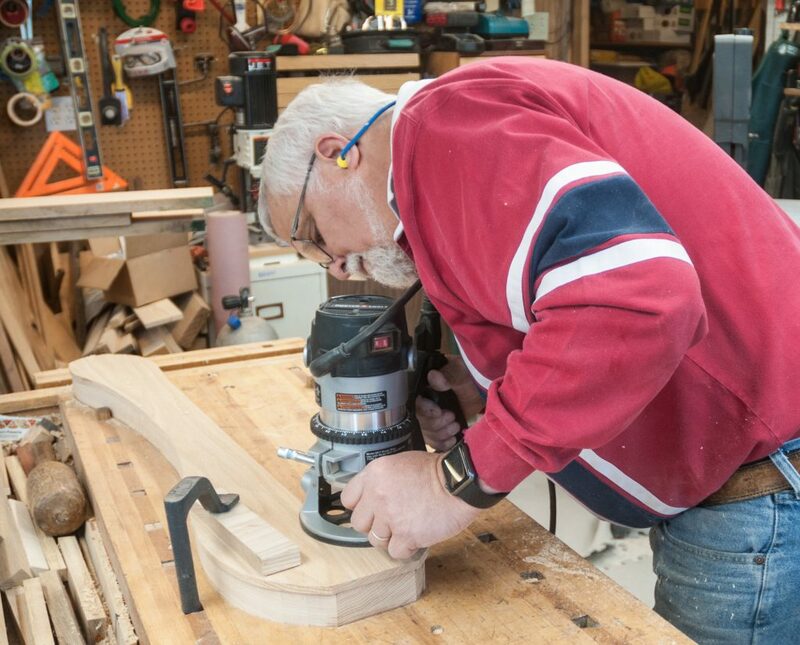 I had some sides on the first batch which did not line up perfectly and I was lucky to be able to fix the fit by sanding the backs of the drawer fronts. 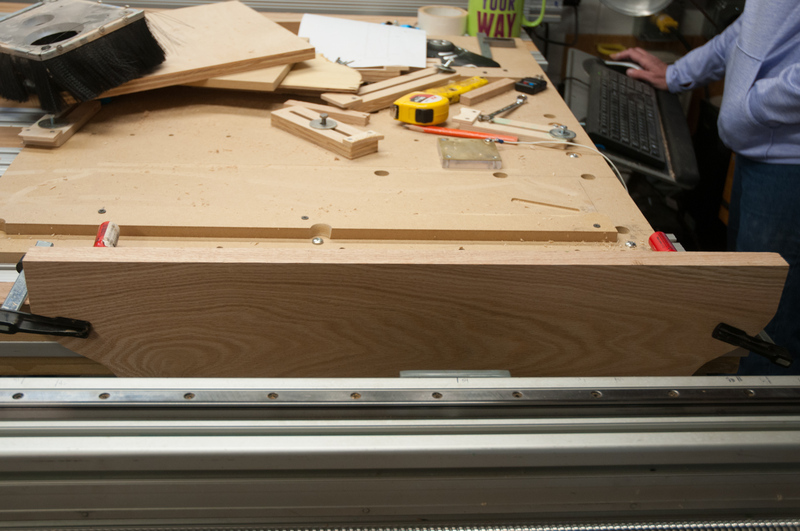 After the first roughing pass, the new stop fingers had been “modified” due to the low Z axis clearance between cuts. Drawer and side thickness MUST be consistent. 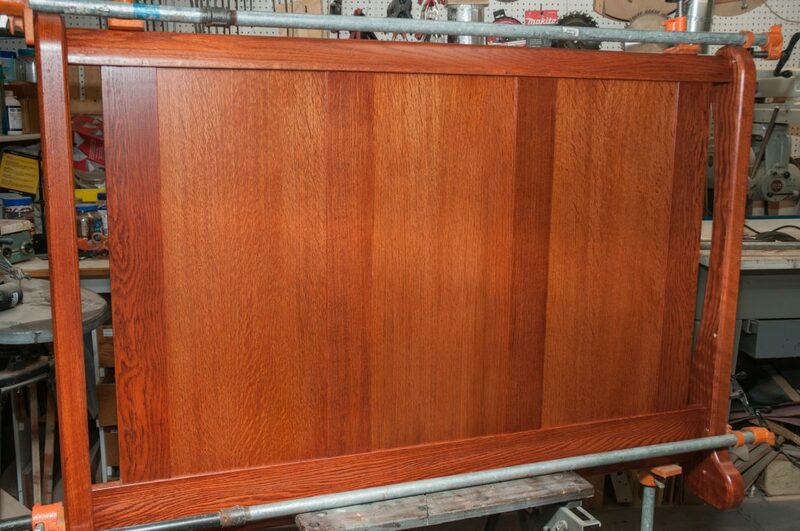 This time all of the boards were drum sanded to the same thickness. It is surprising how much variation even a large well tuned planer has (mine is a 20″ Jet). This made a big difference in the fit for the 18 drawers vs the earlier batch of 9. Planing single handedly does not help. 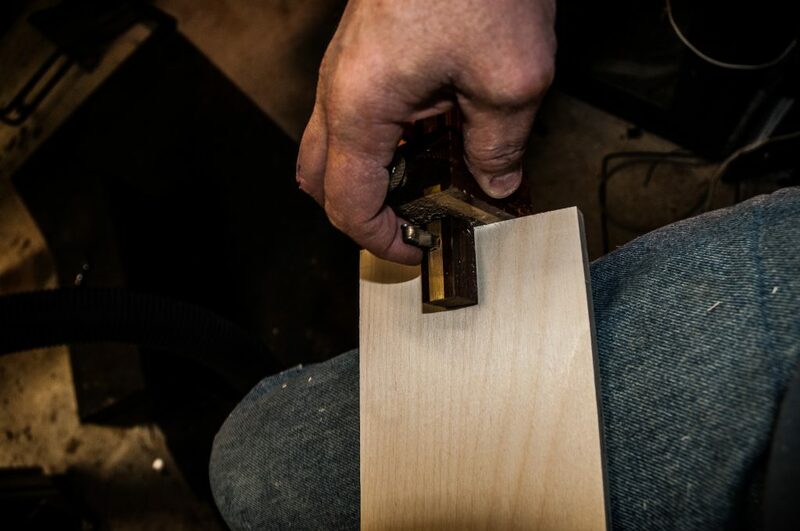 Scoring the faces of the sides to prevent tear-out is a must. The roughing cut sequencing of Joint Cam causes a lot of tear out. 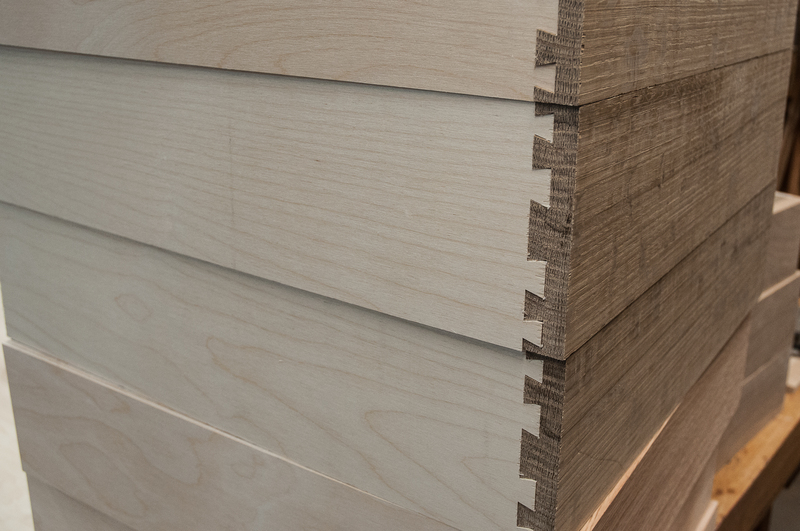 It would be better if the roughing cut was the same sequence as the finish / dovetail pass. 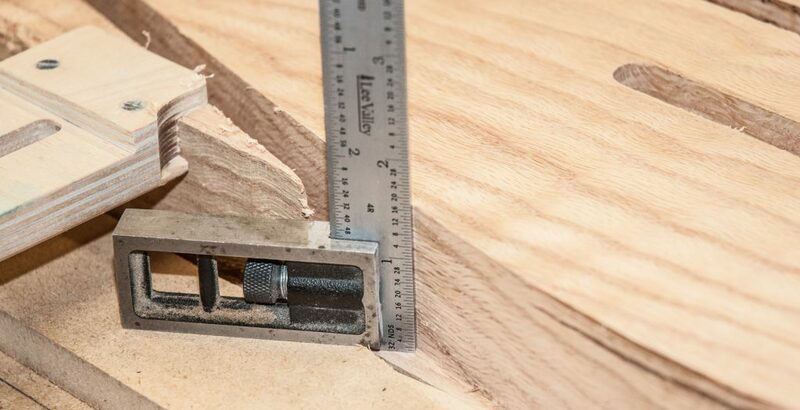 However , scoring the face heavily with a marking gauge, largely mitigates the problem . 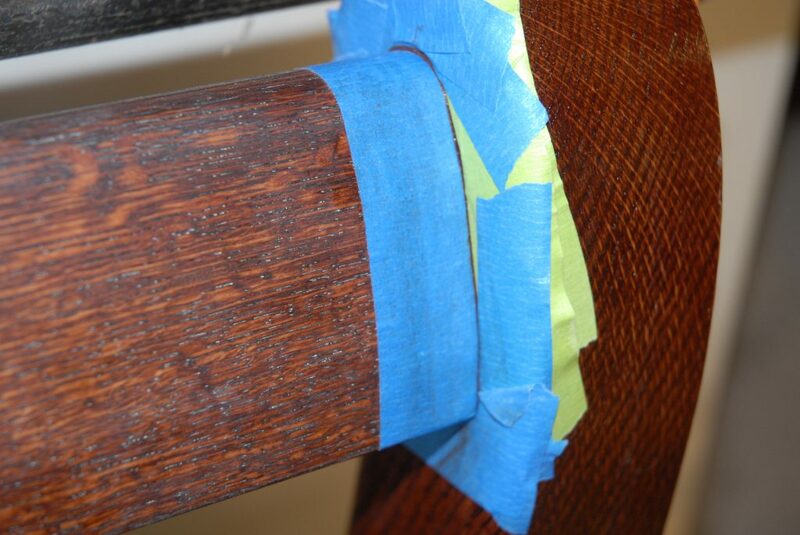 Fixture additions must account for bit profile differences between the roughing and finish passes. 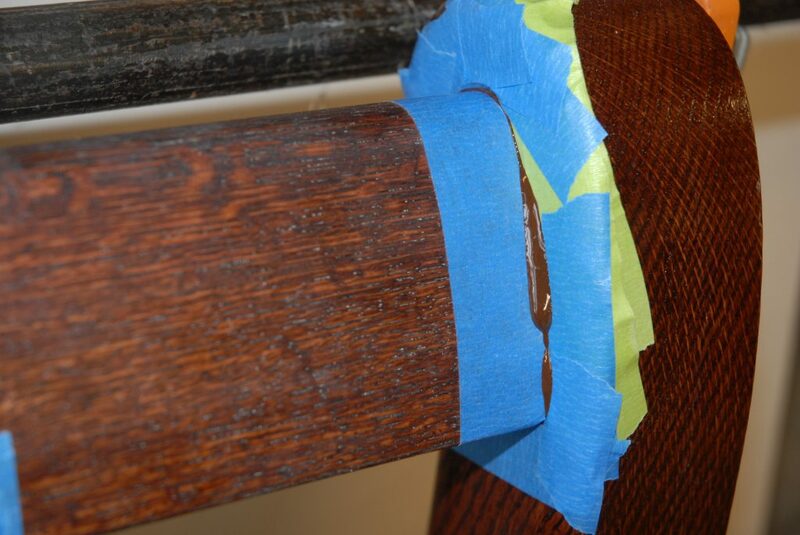 It would pay to run the finish pass air cutting to make sure the fixture fingers are not in the way or you could end up with a snapped bit or missed steps. I had to trim back the corners by hand to allow room for the dovetail shaft. The new LED light ring around the front of the motor nicely illuminates the work . 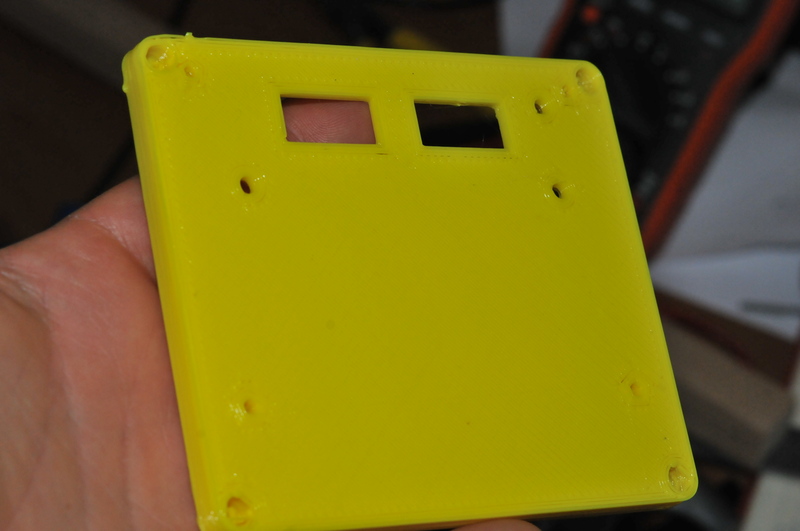 This shows the touch plate I use for setting the Z axis zero. 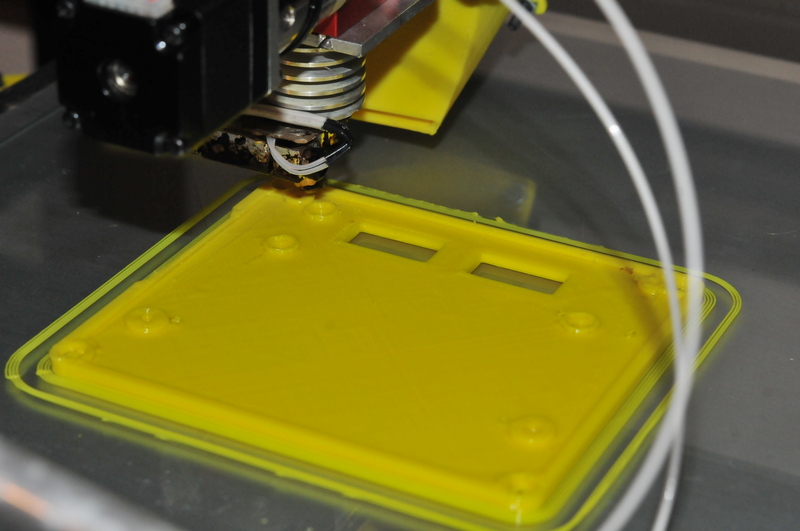 There is something funky with the Mach4 CNC controller touch functions. I now repeat each zero touch to verify the value does not change. 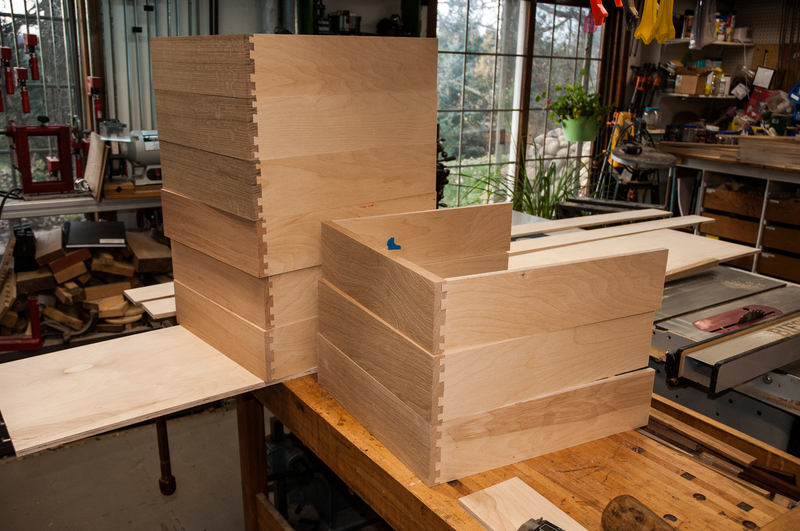 Now for cutting the dadoes and assembling the 18 drawers.